In your face rye bread. Yesterday I hung the washing outside for the first time this year. I know it might seem a strange thing to admit to, but it’s an action that makes me incredibly happy. It’s the combination of the warmth of the sun, the knowledge that the new season is on it’s way, that a corner has been turned, combined with the satisfaction I get from a monotonous domestic chore. I hate doing the washing all through the winter. Not the thing itself as such, but what comes with it; enduring an airing rack clogging up what little free space we have in this small house. The smell of washing whilst pleasing to some is only a reminder that it’s blocking out the light in the dining room as the only place to plonk it is in front of the window. As a result, the moment when I am liberated and can move everything outside is indeed a significant one. But it didn’t last long. The weather has turned gloomy and myself, the cats, and the washing are all huddled in the house again. Funny how often the weather reflects ones mood and vice versa. I’ve had that kind of a week, up, down and all over the place. I’ve been battling a mild cold, and anyone who knows me will tell you that I’m not good at that kind of thing. In all honesty I’m hopeless at any kind of illness. I refuse to believe I might have something right up until the point that I am stricken with my own version of man-flu. The point that I recognised that I might have to give in to this bug also happened to be laundry related. I had loaded the machine with washing and then promptly attempted to put cat food in the powder drawer. I caught myself just in time (thank goodness as Mr L’s shirts might not have survived that one! ), stepped away from all electronic devices and made a cup of tea. Another comedy anecdote from this week is related to trying to do the right thing. After a somewhat ego-bruising nurses appointment (“yes you are rather heavier than last time, but you know that what happens as we get older”) I have been attempting to do the right thing and eat lighter healthier meals, more protein and fibre, less carbs. You know the drill. So on Tuesday morning I had a lovely breakfast of rye bread toast, and promptly felt awful for two days. Turns out that rye bread and my system are no longer compatible. And so, as my sniffling increases and my husky blues voice becomes huskier and bluesier I shall be disregarding all thoughts of health and instead snacking on these little morsels of sweetness. I found the recipe over on A Cup of Jo and knew immediately that I had to try them. In my usual style I changed things up a bit, adding almonds to the mix, using brown sugar and then spliting the dough, adding lemon zest to one half and a chunk of ginger to the other. They’re the perfect mouthful with an afternoon cup of tea, come together in mere moments, and are small enough to justify two or three and still not feel like you’re stuffing your face with cake. So make some of these, and leave the healthy stuff alone this week. In your face rye bread. 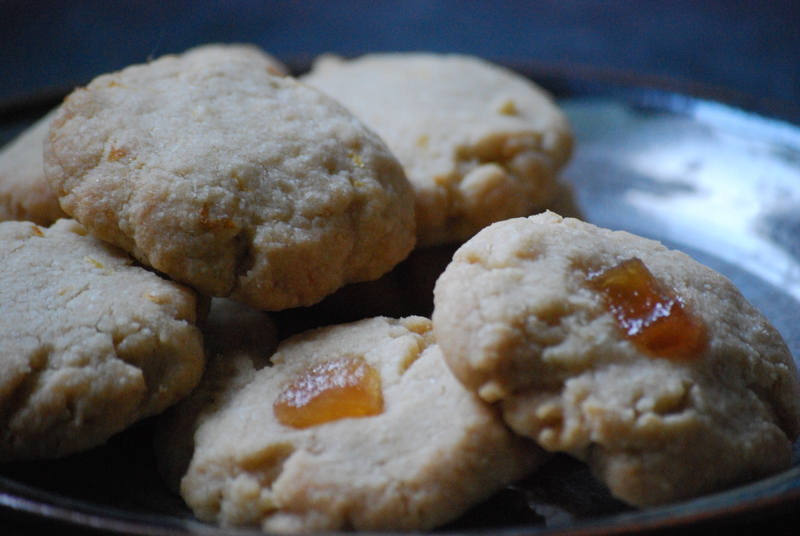 Butter Cookies – Makes around 10 -14 shortbread depending on the size you choose. Preheat the oven to 160C or 320F and line two baking sheets with parchment paper. Cream the butter with an electric mixer, or in a large bowl with a wooden spoon, until light and fluffy, add the sugar and mix again until it looks like buttercream. Carefully fold in the flour and almonds until it forms a loose dough. At this point you can add any spice or zests. In my first batch I split the dough and added the zest of 1/3 lemon to half of the dough. In my second batch I added 1 tsp cinnamon to the entire dough. It’s up to you. Roll the dough into small balls. I like to weigh my cookies so they are all the same size, mine are 23g each. 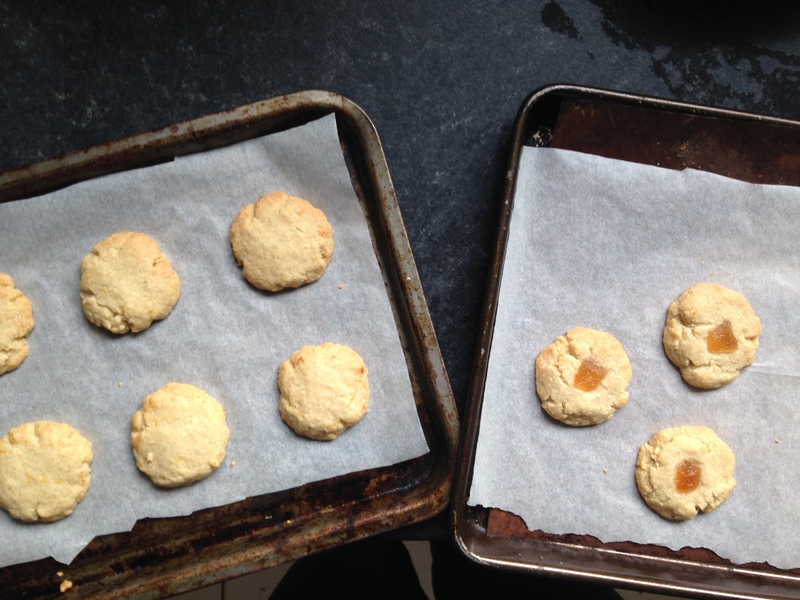 Place each ball of dough on a baking sheet allowing plenty of room to spread, and press down with your palm to flatten. At this point you can add a topping if you like. I went with chunks of crystallised ginger, but next time I’m thinking sprinkles to cheer things up. Place in the oven for 12-18 mins, until just browning around the edges and slightly coloured across the surface. Remove and cool on a rack for as long as you can hold out. I tried drying the washing (well, the dog’s towels) for the first time this year the other day but they were as damp when I brought them in as they were when I hung them on the line. Those cookies look so good. I’d have to sub non dairy spread for the butter, and ‘marg cookies’ doesn’t have quite the same ring, but I’ll be giving them a go. Hope you’re on the mend (though with all that huskiness you’ll probably give a fair rendition of Phoebe-from-Friends ‘Sticky Shoes’).